Grinding fresh pepper and sea salt has never been easier … simply tip these electric salt and pepper mills over food to activate their blades (giving your wrists a break!). 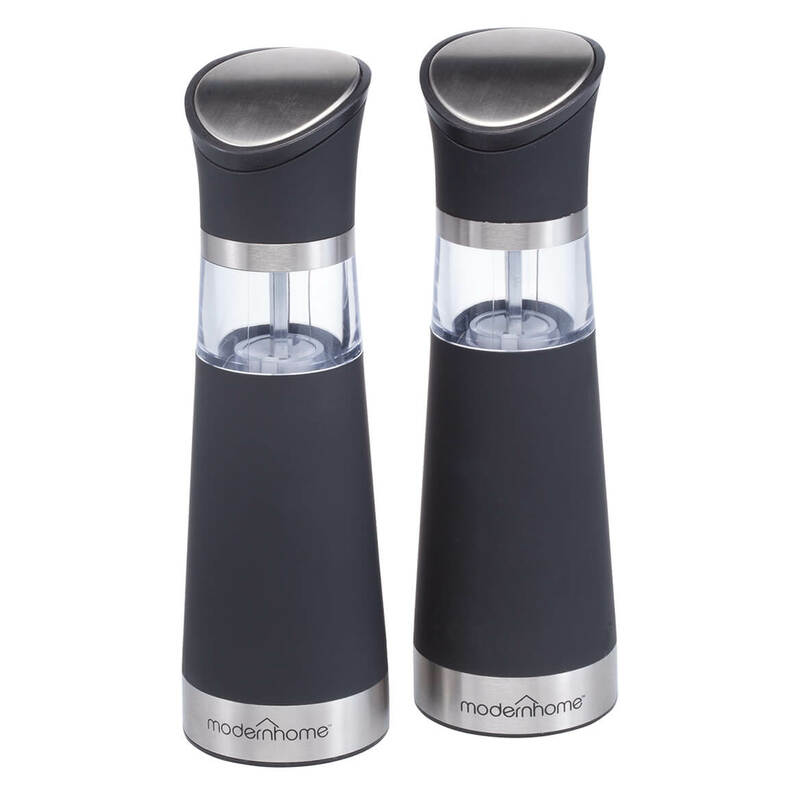 Turn this automatic salt & pepper mill set upright, and the gravity sensors automatically shut blades off; convenient on/off button conserves battery life when not in use. 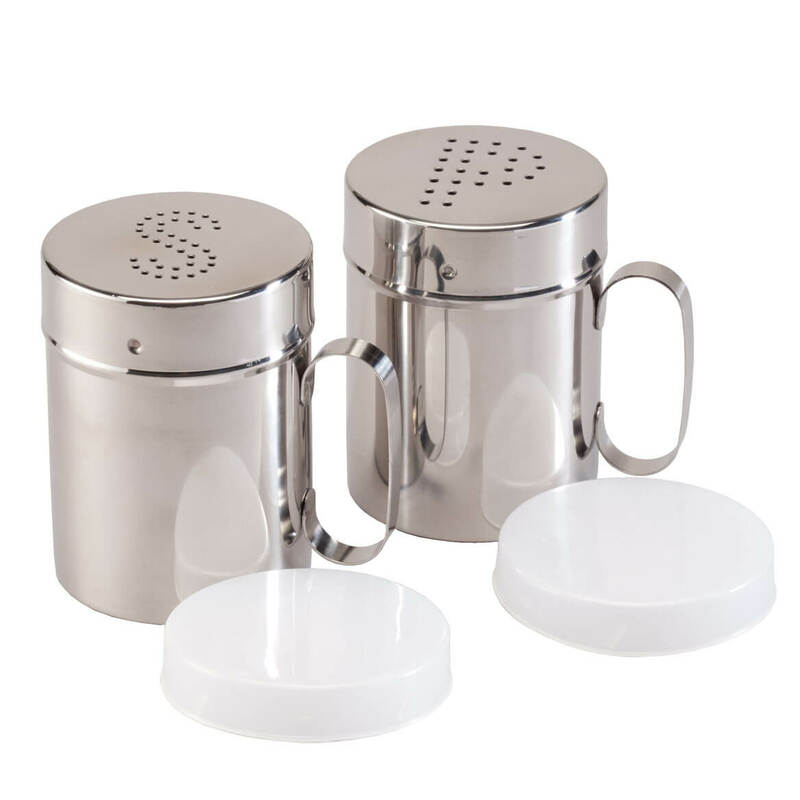 Neat, efficient and effortless, the salt and pepper grinders dispense from the top, eliminating excess mess on your countertop. Stylish black mills feature brushed stainless steel accents and clear plastic windows for easy viewing of contents and fill levels. Each 9″ high mill uses 4 AA batteries (not included). Wipe clean. 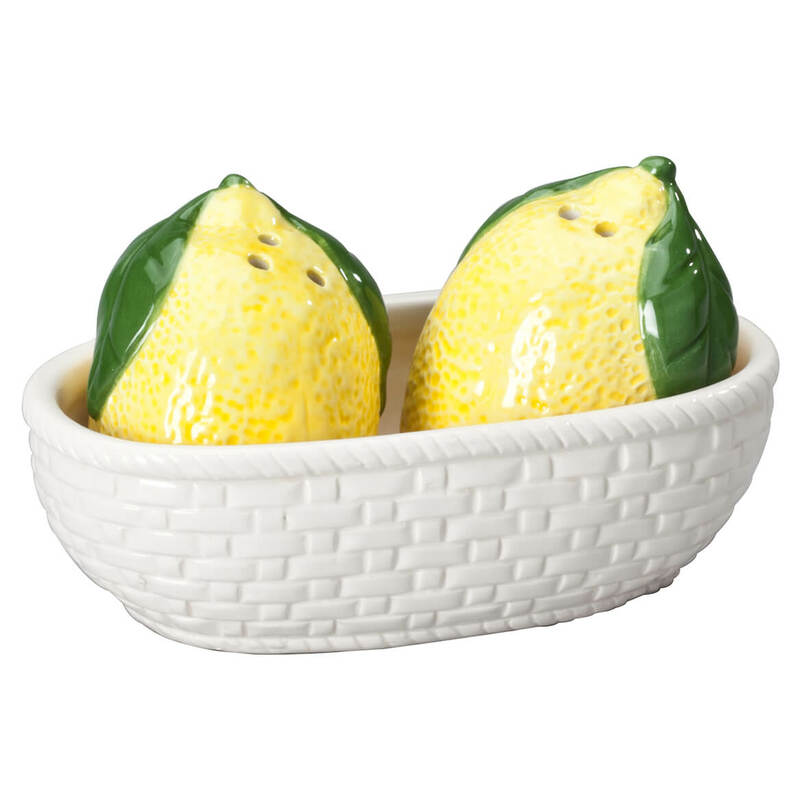 Nestled in a decorative tray, these Lemons salt and pepper shakers have all the charm of your favorite collectibles—spicing up meals and your kitchen décor! Beautifully crafted of shiny glazed ceramic, the ceramic salt & pepper shakers include plastic stoppers for neat, easy filling. Set of 3 includes 2 shakers and 1 ceramic tray with basket-weave details; all pieces hand wash. Shakers: 24″ long x 2″ wide x 2 3/4″ high. Tray: 5 1/4″ long x 3″ wide x 1 3/4″ high. 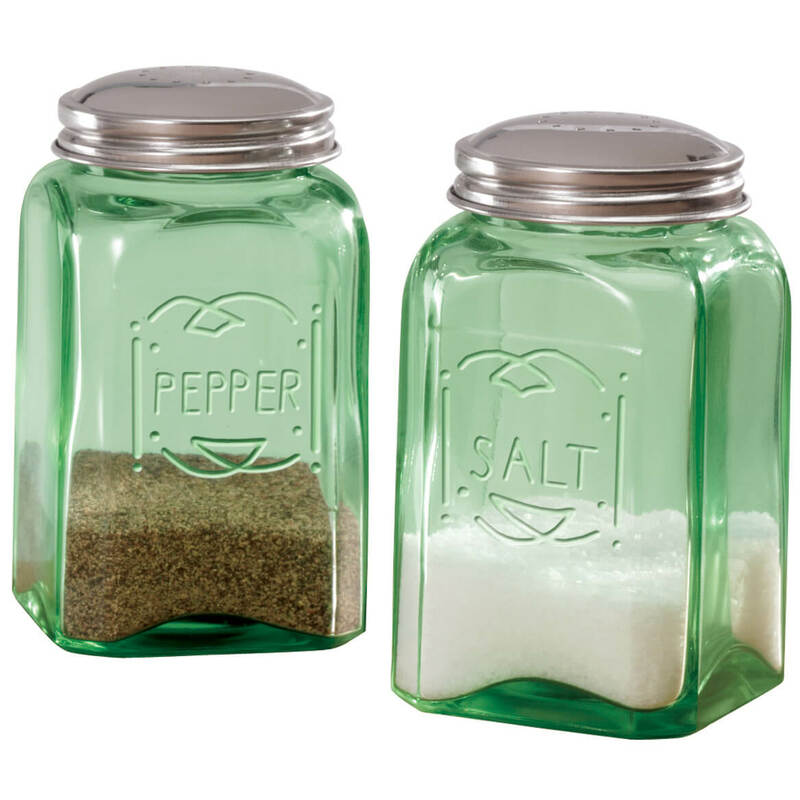 Like the classic canning jars your grandmother loved, these clear glass mason jar salt & pepper shakers lend nostalgic charm to your modern kitchen. Sturdy side handles make these mason jar shakers easy to grasp, delivering a hearty shake of seasoning at stovetop or supper table. Durable stainless steel tops unscrew for easy filling. Dishwasher safe. Set of 2 salt & pepper shakers. Each 1-oz shaker is 1 7/8″ long x 1 3/8″ wide x 2 1/4″ high. With spring-loaded lids that lock moisture out, these moisture-proof salt & pepper set keeps contents dry for smooth, easy shaking—even when dining outdoors. 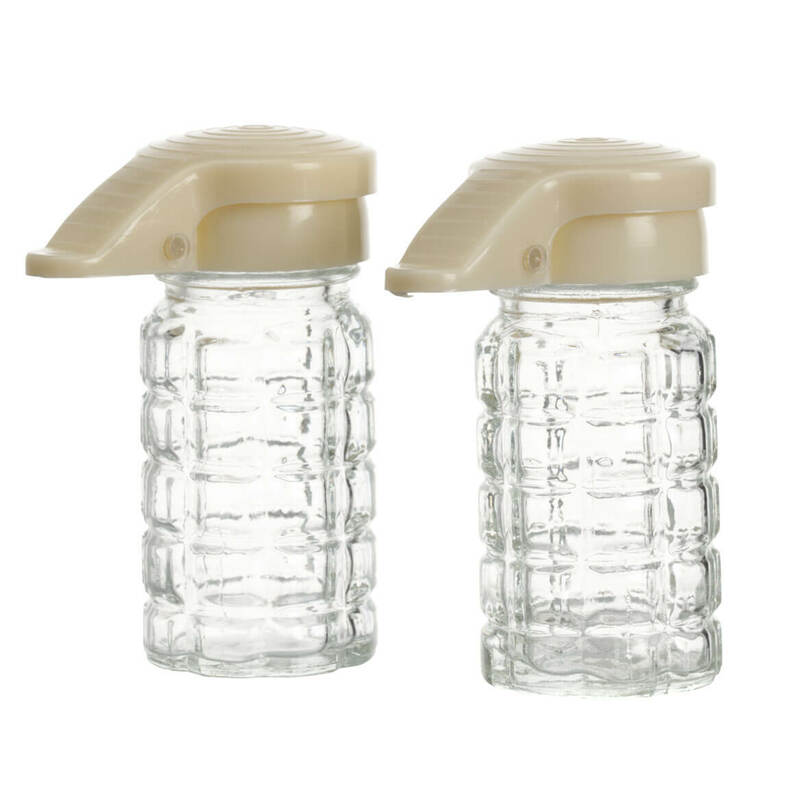 The textured glass shakers feature hinged plastic lids with airtight nozzles that seal out humidity, delivering a perfect stream of salt and pepper without clumps or clogs. Great for picnics, camping, backyard barbecues and more, they work every time … no rice required! Set of 2 travel salt and pepper shakers. Each, 3 1/2″ high x 1 3/4″ dia. Hand wash. Salt and pepper not included. A regal rooster and brood of baby chicks adorn these decorative rooster salt and pepper shakers, lending farmhouse charm to any kitchen. 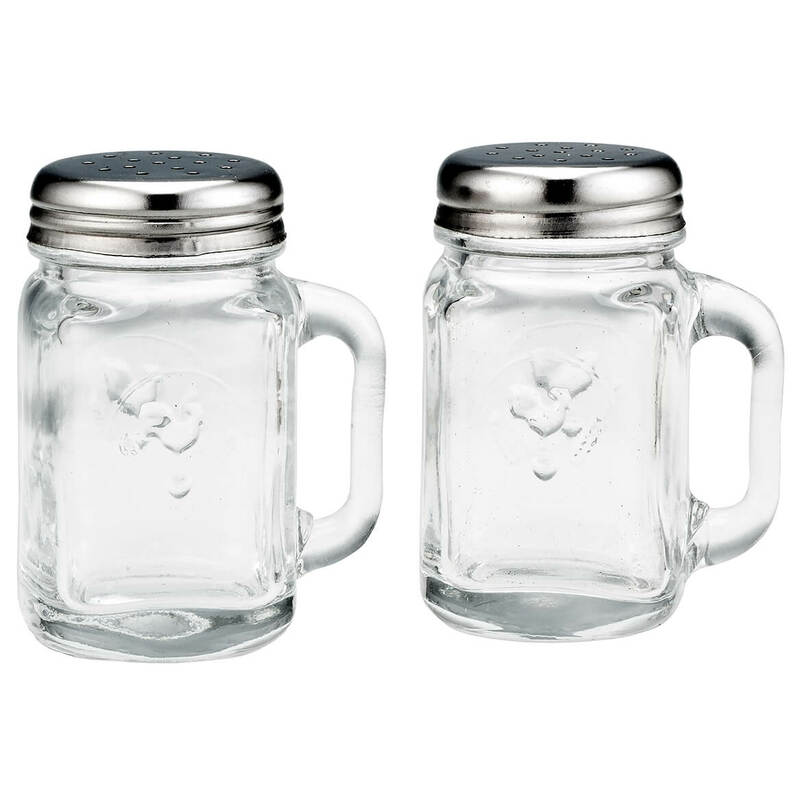 Matching artwork adorns the glass salt and pepper shakers; chrome “S” and “P” shaker caps screw off for easy filling. Hand wash. 3 3/4″ high x 1 3/4″ diameter. Did your mother or grandmother have stainless steel shakers like this? These big stainless salt and pepper shakers are quality 18/10 stainless steel, with slide-on plastic covers for when they’re not in use. The handles feel right, and the tops twist off for refilling. Dishwasher safe stainless steel salt and pepper shakers. 3 3/4″ high x 2 3/4″ diameter. 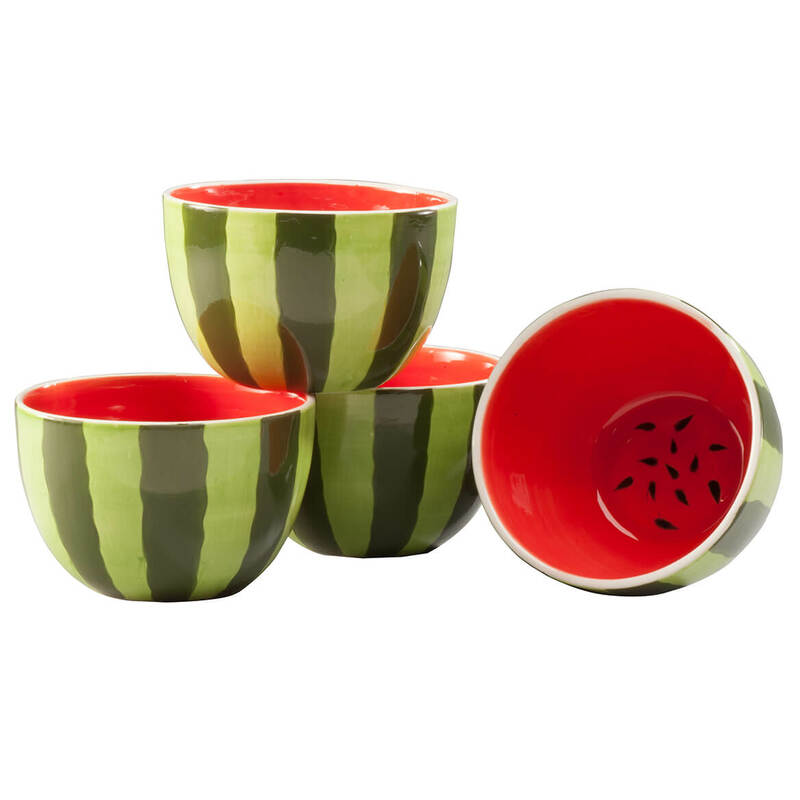 Serving fruits and desserts in bright juicy style, these cute ceramic watermelon bowls are handpainted to look like watermelons, inside and out. Perfect for fruit salads, berries, pudding, yogurt and more, the 14-oz. serving bowls are great for snacks and entertaining … adding a splash of summertime charm to any meal, year round! Dishwasher and microwave safe. Set of 4 ceramic bowls. Each, 3″ high x 5″ dia. 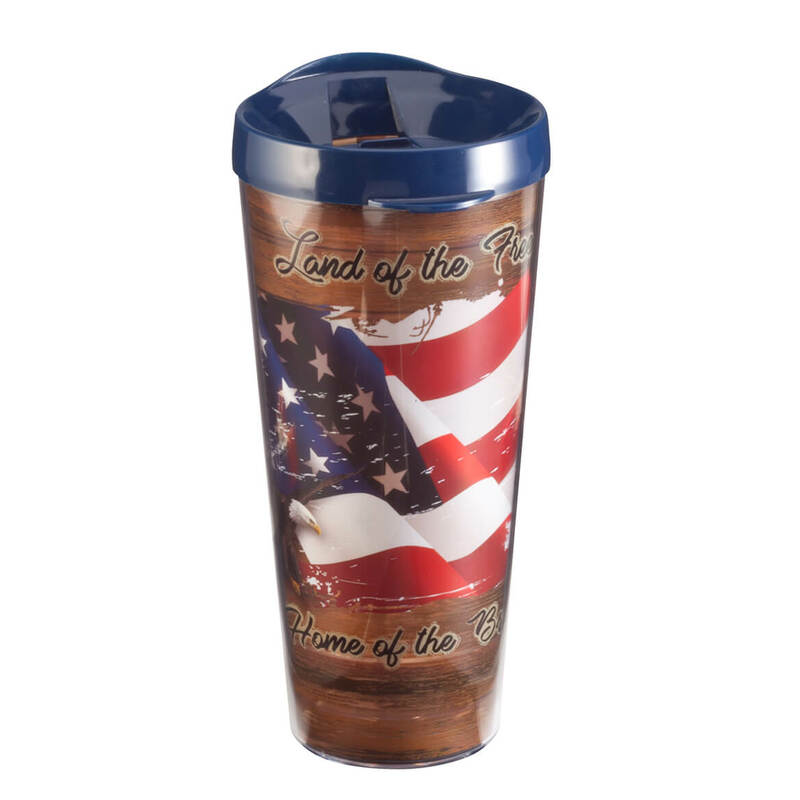 Proudly showcasing our exclusive Americana print, this double-wall insulated tumbler keeps hot drinks hot and cold drinks cool! Made right here in the USA, the Tritan™ 22-oz. Insulated Tumbler is constructed from sturdy, FDA-approved plastic that’s completely BPA-free—and Tritan backs this durable drink tumbler with a lifetime replacement guarantee. Conveniently fitting most auto cup holders, its spill-resistant snap-on lid features a thumb-slide with room to add a straw or drink without. Double-wall construction is designed to prevent condensation, keeping beverages the perfect temperature inside, while the exterior remains comfortable to hold. Offering quality, style and easy care, this plastic tumbler is safe for dishwasher, freezer and microwave (lid is not microwave safe). Generous 22 oz. size is perfect for travel, home or office. Great for morning coffee, poolside lemonade or all-day hydration, this double-wall insulated tumbler keeps hot drinks hot and cold drinks cool! Made in the USA, the Tritan 22 oz. insulated tumbler is constructed from sturdy, FDA-approved plastic that’s completely BPA-free—and Tritan backs this quality drink tumbler with a lifetime replacement guarantee. Compatible with most auto cup holders, its spill-resistant snap-on lid features a convenient thumb-slide with room to add a straw or drink without. Double-wall construction is designed to prevent condensation, keeping beverages the perfect temperature inside, while the exterior remains comfortable to hold. 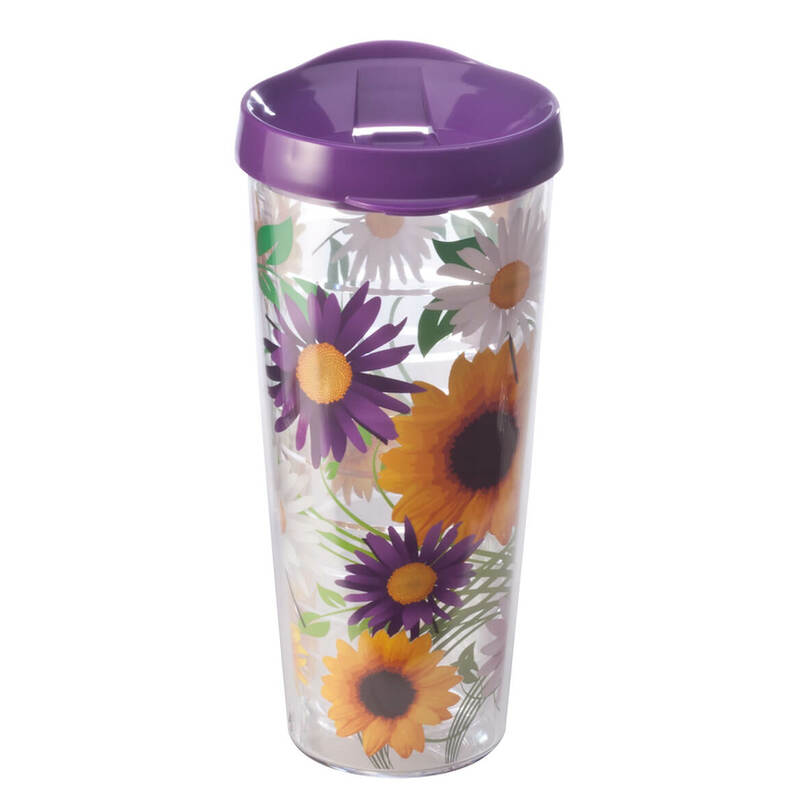 Our exclusive floral print adds a touch of style, and this beautiful plastic tumbler is safe for dishwasher, freezer and microwave (lid is not microwave safe). Generous 22 oz. size is great for travel, home or office. Designed in a soft shade of light “bottle green,” these salt & pepper shakers are reminiscent of Depression glass, which brought cheer to many American kitchens during otherwise dreary days. 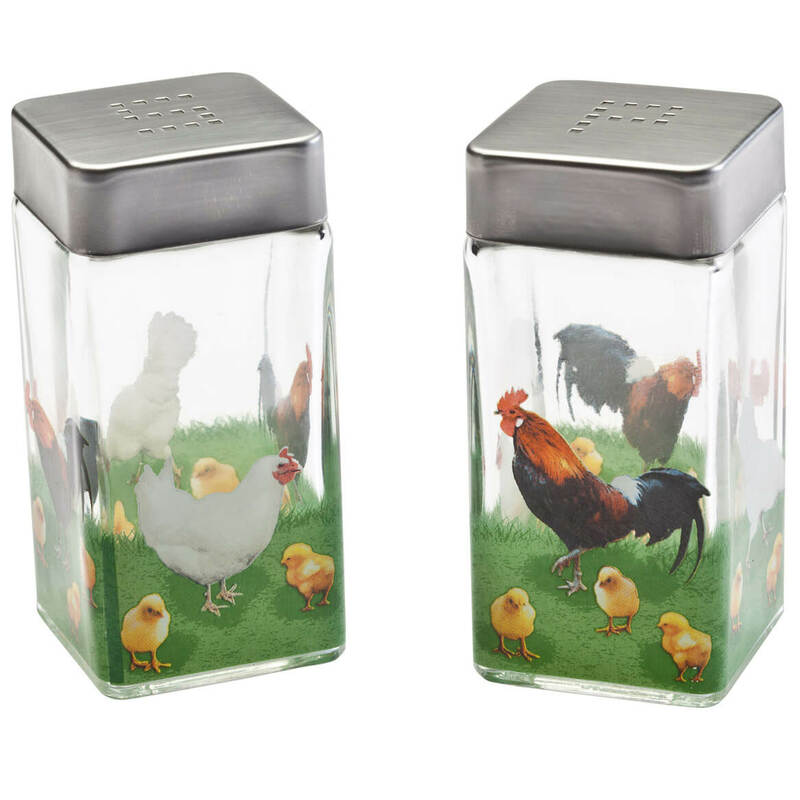 Salt & pepper shakers are 2 3/8″ long x 2 3/8″ wide x 4 1/4″ high with metal screw-on tops. Dishwasher safe.